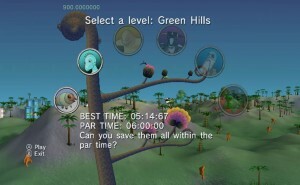 The first screen you will see when you start a new game will be the Level Selection Tree. At first only one branch is accessible. 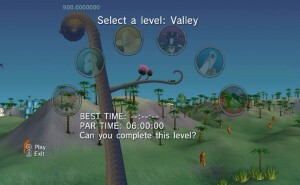 Levels are represented by flower-buds on each branch of the tree. 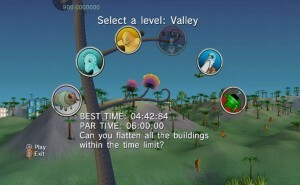 Level locations can be selected by navigating using the Wii Remote Nunchuck left and right, then pressing (A). 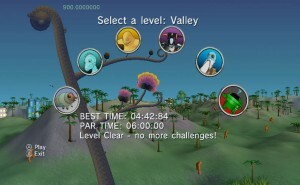 Once you have unlocked a new branch, these can be navigated by using the Wii Remote Nunchuck up and down. As you progress through the challenges for a particular level the flower-bud for that level will blossom into a full flower. By the end of the game you should have a tree that is blooming with healthy flowers.